In the world of hair, there are two types of people – those who don’t have to think about their hair, and those that do. I fall in the later category and therefore I am always on the look out for tips and tricks to make my hair a little more manageable. 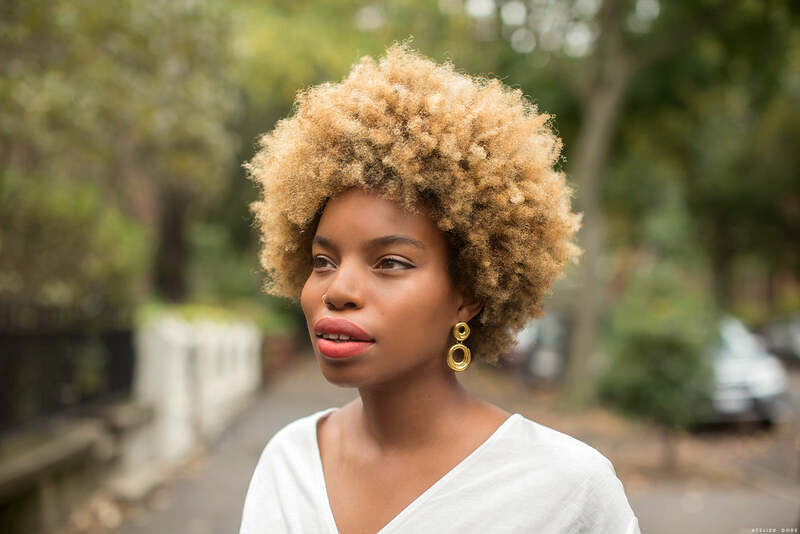 We put the call out to our readers (and some of our favorite heads of hair we’ve featured on the site!) for their best tips and I’m thrilled to share some of our favorites below. What’s your hair secret? Please share below! One can never have too many hair tips. And we’re planning on doing another similar post soon focused on the straight hair ladies! I recently cut my long hair short, a little longer then chin length, and discovered it has a natural wave to it that I never saw when it was long because its thick and heavy. I have found with shorter hair I do wash it more often 2-3 but try to let it air dry to get a little texture and add Oribe’s Apres Beach Wave spray which is amazing. I always used hot rollers to curl my long hair but haven’t found the best approach with my short hair yet. I’m not skilled with an iron. French Girl organics has a great hair oil for ends or as a treatment before shampooing. I use a mask once a week by Christophe Robin his Lemon mask is my favorite. I also use his Salt Scrub especially in the Summer. I love Bumble and Bumble’s primer spray, it has vitamins and is great for a daily use or touching up second day hair. I’m on the lookout for a serum. A year ago I decided I’m done with shampoo that strips my hair, just to put in a conditioner to tame my hair, and then a product to give my hair body again. For the last year I water wash only, deep condition occasionally by using olive oil on my ends for 20 minutes before washing and if needed I use a bit conditioner once a week or so after washing. My hair never gets very oily or dirty so I can easily simply rinse with warm water and use a gentle washing method with my fingers only to get my hair really, really clean. I also use a boar brush to clean out any debris on a daily basis. My hair has never felt better – or looked better, come to think of it! Full disclosure: I have my hairdresser put in some highlites every 3 months or so, so I do have her shampoo and condition then as needed. So, I’ve basically shampooed my hair 4 times in the last year. My hair looks very clean and smells great (again, I have no oil or dandruff but dry hair) and people compliment on my hair all the time. Sabine, do you mind sharing if your hair is fine or thick? Would love to know if this works on all textures and thicknesses. I know this sounds funny, anytime I go to someone new to cut my hair they can’t believe it, but my hair is pretty short now and after I wash it I rub in a good lotion and sleep on it wet. I have great bedhead hair, kind of beachy waves so I’m super lucky. Someone at Vidal used Lubriderm once and I changed the lotion, sometimes use a light oil too but it works really well. Depuis quelques temps, mes cheveux sont devenus une quasi obsession. Je trouvais ça ridicule, parce que ce n’est pas l’essentiel dans une vie, des cheveux. Mais bon, l’image qu’on offre au monde, ce n’est pas rien ! C’est son outil de travail, son meilleur support théâtral. Je les perds un peu. J’ai moins de masse, moins de cheveux au-dessus du crâne depuis quelques temps. J’ai fait une prise de sang, on verra si un truc cloche ! Alors pour qu’eux et moi on s’entende de nouveau, je les ai d’abord coupé un peu, en un genre de carré long, pour leur redonner de l’élan. Mes boucles ont repris vie, puisqu’il y avait moins de poids à porter pour elles. Ensuite, j’ai un rituel quasi religieux. D’abord, je ne les lave qu’une fois par semaine, le dimanche matin. Honnêtement, ça change tout. Je me souviens d’une époque où je les lavais tous les jours, assassine. Au réveil, j’applique en pré-shampooing Roots, de chez Lush. Il y a de la menthe, si vous avez bu trop de spritz la veille, c’est un sauveur ! Il apportera du corps et du volume, c’est fou. Je le laisse poser bien une heure et demie, à boire du café et écrire. Ensuite, je rince bien et procède au saint lavage. En ce moment, avec le combo shampooing et conditionner Tigi Head, le flacon rouge. J’en suis plutôt contente pour le moment. Je démêle mes cheveux au peigne, le conditionner échouant dans la douche, parce que j’ai eu la patte un peu lourde. Puis je mets de nouveau un masque, un truc qui pose peu de temps. Celui de chez Aussie fait son boulot en bon soldat. Ensuite, je les sèche avec une serviette en microfibre. Je la noue en turban et attends bien 20 minutes. Je sèche ensuite au diffuseur, tête en bas. J’applique une pommade en finition, et TADAM ! Je me refais généralement un café, après ce commando, épuisée de cette mission. La semaine, je mets un peu de pommade le matin (R&B de chez Lush est vraiment chouette), quelques gouttes d’huile le soir (de l’huile de jojoba convient parfaitement). Je pense m’offrir la Wet Brush, histoire de rolls roycer tout ça.